The 20th century's first man lands on the moon and discovers - that Baron Munchausen has already beaten him to it, along with Cyrano and characters from Jules Verne's lunar-landing novel. The Baron spirits the young cosmonaut by horse-drawn ship back to an ancient "Earth", where they insult a sultan, rescue a princess, fall in love with the princess, and then as a trio have further experiences in a world of pastel colors, ornate dreamlike settings, and the inevitable angry disrupters of peacefulness and love. 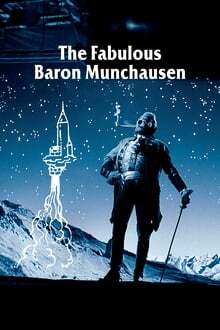 We don't have any reviews for The Fabulous Baron Munchausen.